Home Costs > How Much Does a Garage Door Opener Installation Cost? How Much Does a Garage Door Opener Installation Cost? Garage doors openers are capable of opening, closing and even holding the garage door steady. Most garage doors also have a sensor toward the bottom to ensure that the door does not close on anything or anyone. Garage doors are classified by its power, meaning the more horsepower it has, the higher the price will be. The cost of a garage door opener will depend on the horsepower, the brand and if you choose a professional to install it. A chain-driven opener can cost $150 to $350, while a belt-driven opener can cost $200 to $300. A screw-driven opener can cost $180 to $300. The popular Liftmaster garage door opener, for example, can cost $165 to $220. 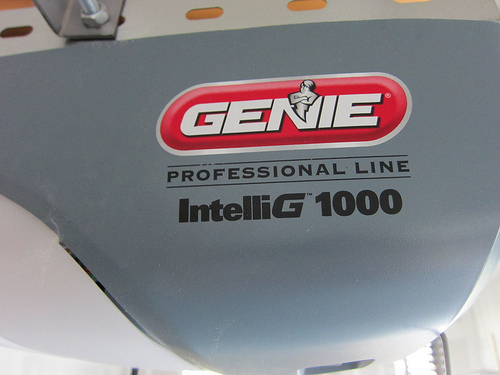 Genie, another popular brand, can cost $115 to $250, depending on the horsepower and features. The average cost to install a new garage door opener can cost anywhere from $200 to $550. Adding in the opener costs mentioned above, your total could be anywhere from $350 for a simple replace to $1,100+ for both the opener and installation job. Amazon.com says the average replacement will be about $82. The most common types of garage door openers include the screw driven, chain driven, belt driven and jackshaft openers. Chain-driven openers use a chain to open the garage door and can be louder out of the three but are considered to be the most cost-efficient. These openers are extremely reliable and are best for a detached garage. Belt-driven openers will be similar to the chain-driven, but it will use a belt to open the garage door. These openers will be a bit more in price, but for the money, you get a quieter opener. These garages may have WiFi capabilities and are also ideal for detached garages. A screw-driven opener will rotate a threaded steel rod to open and close the door. With fewer components, the maintenance is minimal. Lastly, a jackshaft garage door opener can be installed on the side of the walls instead of the center of the ceiling like other openers. Using a trolley bar to open the garage, these types can be found in a commercial setting since it’s designed for garage doors taller than eight feet. The typical horsepower will be 1/2 or 3/4. 1/2 horsepower garage door openers will be enough for a two car garage while a 3/4 horsepower opener will be ideal for heavier doors such as carriage doors. Features, depending on the brand, may include the following: a manual release, which enables you to disengage the opener from inside the garage; a security light that activates every time the system is used; miniature key remotes; built-in WiFi; vehicle compatibility; an auto-close function and battery backup installed within the opener. Garage door openers usually come with a remote control as well as the sensor that receives the signal. This can be an additional $70 or so for a backup unit. Most of the garage door opener kits have a remote control or two included with it; however, you have the option to purchase a universal remote control which can cost anywhere from $25 to $50. People often purchase additional remotes to give to a close family member or friend. Some openers may not come with a remote at all, so this purchase may be mandatory. A keypad, which installed on the outside of the garage door, will open your door whenever a PIN is inputted. These keypads can cost $30 to $60. Some openers may not come with lighting. While some may come equipped with a light bulb, some owners opt to have an extra light installed. Garage doors taller than seven feet will have a larger rail size. Eight-foot doors often pay $25 to $50 more, while those with 10-foot doors can pay close to $100 more. Many models won’t come with a battery backup, and if your power were to go out, the opener would be useless. The average garage door opener is expected to last 10 years. Know what you’re going to get with your warranty since every company is different. You will want to know how long the warranty lasts and what can be covered in case something were to fail. With newer garage doors, you can control them from your smartphone. The garage door opener app like MyQ Connected Home, for instance, allows you to control your garage door from anywhere. It can also offer you alerts each time your door opens and can even let you know if it’s opened or shut. If you want a garage door with these functionalities, see if there’s an app tied in with the garage. What size garage door opener do I need? For most standard one, two and three car garages, a 1/2 horsepower model with suffice. You will only need something more powerful than this if you have a garage door that is taller than eight feet or your doors are heavier than a traditional door. A belt and chain drive garage door opener are almost identical to each other, but there’s one main difference; it uses a belt instead of a chain. Also, a belt drive garage door opener will also use a steel-reinforced rubber or fiberglass instead of a standard chain. For heavier doors, a chain door opener is ideal. Belt drives are quieter and are a pinch more than a chain opener. These openers can lift a garage about seven inches per second and has a smooth operation. Chain drives tend to be the most reliable and can be less than a belt drive. These openers can be very loud and the chain may need to be adjusted every so often. Buy a garage door opener with enough horsepower. There is no need for a heavy-duty garage door opener if you have a small garage door. If you want to get the garage door installed by a professional, get multiple quotes for free from HomeAdvisor.com. Check with local retailers such as Lowe’s, Home Depot or Sears. These stores can often install the garage door for less than $200 if you purchase the door through them. Some people say installing a garage door isn’t as hard as you think. As long as you have some handy and electrical skills, it can be done. Refer to the video below to see how it can be done.